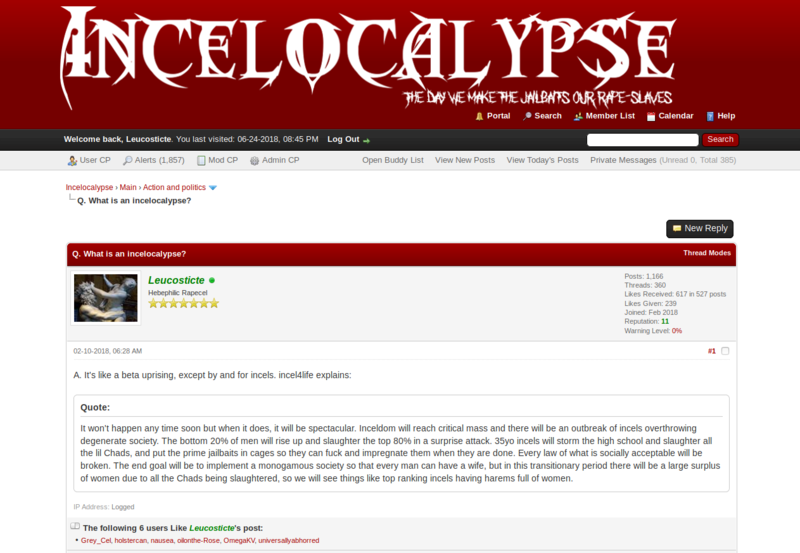 Incelocalypse is a now-defunct Internet forum that existed from 7 February to 25 June 2018. It was originally hosted at Incelocalypse.today (while at Dreamhost, which took the site down in response to complaints from r/IncelTears users and an inquiry from Babe) and later Incelocalypse.ru (while at RU-Center, which took the site down in response to a complaint filed with Cloudflare). All site data was lost in an 18 July 2018 burglary. The successor site is R.G.I.F. This page was last edited on 6 December 2018, at 17:58.